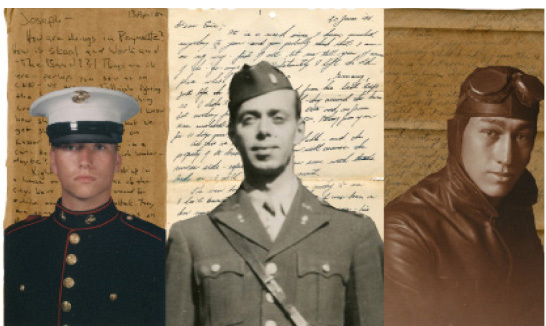 Three letters from three eras (left to right); Andrew Brady with his letter from 2004, Kenneth Zerwekh with his letter from 1945, and Charles Stuvengen with his letter from 1918. There are still service members who, for a variety of reasons, write the occasional letter with pen and paper. Sometimes, they even choose to write letters because they have something out of the ordinary on which to write. Andrew Brady, a Poynette native who served with the 3rd Battalion, 4th Marines in Iraq during the early years of Operation Iraqi Freedom, donated to WVM over one hundred emails that he exchanged with his family during his overseas service. He also donated one physical letter that he wrote to his brother, Joseph. This letter is interesting for two reasons. One is that he clearly felt more free to write about his real experiences with his brother than with his parents, writing to him about being shot at often with the instruction, “Don’t tell Mom, I know how she would worry.” The other interesting aspect of the letter is that it is written on a piece of cardboard from an MRE box. Because he also wrote emails to Joseph, it is clear that he chose to physically write this letter because of the uniqueness of the medium.